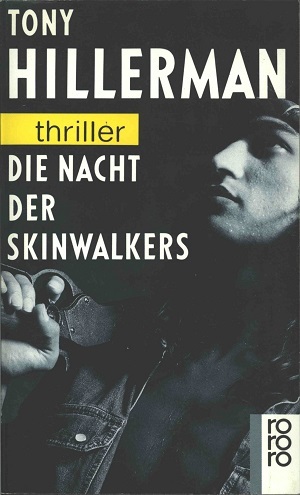 This is the first German paperback edition of Skinwalkers. This edition was published in 1988 by Rowholt Taschenbuch Verlag GmbH, Hamburg, Germany. Tony Hillerman's original text was translated from English to German by Klaus Fröba. The title directly translates to "The Night of the Skinwalkers." The cover was designed by Thomas Henning and Bettina Scheffler. This cover features a black and white photograph of a Native American man with a rifle resting on his shoulder. Binding: Black and white paper covers with the thriller number, title, author, and the publisher's logo.